You are here: Home / Snapshots / Progress, despite the weather! It rained for 13 hours solid yestrday (Saturday) and caused more chaos on roads and rail. Our local train between Wellington and Johnsonville was de-railed close to Khandallah because of a landslip. 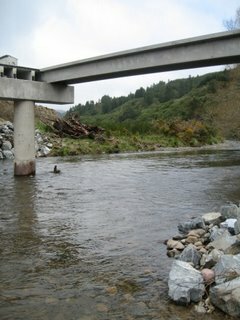 We saw them cleaning up the debris when we headed off to Kaitoke to see whether the bridge had been swept away. It was a delight to see the progress is being made and expectation that it might actually complete on Wednesday as planned. You’ll see from these photos that this is a substantial piece of engineering. 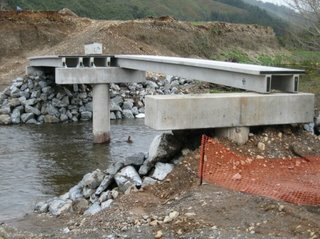 Give the potential for rising level and speed of the Pakuratahi stream it needs to be big enough to withstand what nature throws at it. We also met up with our neighbours – one set who have a horse treking business and the others who are setting up a organic and biodynamic small holding. It was fantastic to talk to others who share our enthusiasm for the location and for the potential lifestyle. We also bemoaned the developer who is responsible for the sites. We’re trying to keep optimistic as we look like only having a 3-4 month delay, they have been waiting for 8 months for the bridge to be constructed so that they can easily reach their land (which is split across the river) and for completion of their fencing. Fingers crossed that this isn’t signs of things to come for us. Big hui (meeting) with the vendor this week to get the story straight and translate to legal agreement so fingers crossed we’ll have more certainty by this time next week. Almost the access we need to get to our new land! Previous Post: « Has Spring arrived?